Regional teachers' unions (ELME) voted yesterday on the proposal to strike put forward by the Federation of Secondary Education Public School Teachers (OLME) to stage a strike on the first day of the national university entry examinations on 17 May and then to continue with a five-day strike on 20-24 May. The Communist-affiliated labour union PAME came up with a counter-proposal to hold a strike on 16-17 May only. Participation was very high nationwide in the ELME assemblies, which voted massively in favour of the strike proposed by OLME, despite an order for civil mobilization of teachers issued preemptively by the government that came in effect today at noon. Under the terms of civil mobilization, teachers who actually go on strike face the risk of losing their jobs, or worse. It remains to be seen if the strike will actually take place or if the vote was merely a gesture of defiance by teachers towards the government. 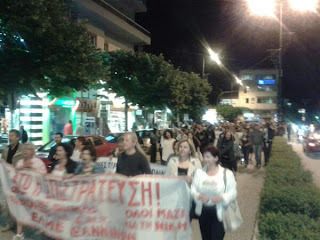 The demonstration held on Monday evening in Athens against civil mobilization and the vote of the ELME assemblies did however not deter the government, which proceeded today with commandeering all school buildings and asking the police to guard them in order to avoid occupations of school buildings to prevent the exams from taking place. In a statement released today, Amnesty International says that "the use of special government measures to thwart a proposed teachers’ strike in Greece violates the country’s international human rights obligations" and calls the measures "disproportionate and unnecessary." Yesterday, it was reported that the police even entered schools where teachers were holding their assemblies to distribute mobilization orders. The video below is from the island of Chios where teachers reacted angrily to the arrival of the police in the middle of the assembly. Today the police came to my school. I was in the classroom and felt my heart sink as soon as I saw them. But I interrupted the class abruptly and stood to attention so enthusiastically that the ground shook as I saluted them. They saw me from outside and stopped to look at me awkwardly, not knowing what to do. In the end, they asked from the window: "Where's the head teacher's office?" I answered: "The Commander's office is three doors down the hall." They smiled awkwardly and left. The kids then asked me why those "bullies in blue uniforms" had come and why I acted that way. I said what I had to say and the kids (most of them) told me that they're on our side. I was moved. Then some kids stood up, came to my desk and said: "Don't be sad, Sir. We'll clean up this mess for you and for us and for everyone someday soon. We just can't do it yet. Be patient. We will." Twitter user @gazakas also re-posted a Facebook message from one of his colleagues, who was called by the police and accused of giving "false information" to the Ministry of Education, because her official address, meaning the home of her parents, is not the place where she actually lives and where they sought to deliver her mobilization order. And my parents were accused of "hiding information" because they don't remember my new address. But how could they remember it when, in the 9 years I worked in public education, I had to change FOR THE NEEDS OF THE SERVICE my place of residence 4 times, my address 6 times (all of that at my own expenses, don't forget that) and every summer my place of residence is my parents' home since our flats in the islands become bedrooms for tourists (I had to pack and unpack 13 times in 5 years... and once I got the bonus of switching from Leros to Kalymnos in the middle of the year, and my supervisor was barking because it took me three days to get there in January - boats were not allowed to sail because of the weather and the islands were in a state of emergency - and after I arrived in Kalymnos on Monday, on Thursday they sent me to Rhodes! So what address am I supposed to give to my administration? Oh, and let me say too that this year, I'm seconded to a primary school... so if they really need my unique, unforgettable skills for the university entry exams, then my primary school pupils will have to spend a week... without a teacher? "Students first", don't they say? Don't you see how much they really care about the students, how much, really? I'm moved to tears! Meanwhile, the situation between labour unions remains tense as OLME and its ELME constituents are still voicing their disagreement with the Umbrella Union of Civil Servants, ADEDY, to go on strike yesterday instead of Friday. ADEDY and the General Confederation of Workers GSEE are however proceeding with a 3-hour work stoppage tomorrow and a demonstration in Athens, but several ELME assemblies yesterday decided to suspend their participation in ADEDY and to stop paying membership contributions. We compiled below the details of decisions voted by ELME assemblies, as well as statements of solidarity by a wide range of organizations and groups who condemn the government's decision to proceed with preemptive, open-ended civil mobilization. This list may not be comprehensive. Other teachers' assemblies not only voted in favour of the strike but decided to stage further action. The teachers of the Corinth sector 1 ELME decided to wear black armbands reading "conscripted teacher" on the day of the exams, indicating that they are likely not to seek to actually strike. In Arta, Evros sector 1, Imathia, Ioannina, Lakonia and Thesprotia, the teachers staged a spontaneous demonstration after the assembly vote. Another demonstration is planned in Pyrgos, Ilia tonight, at the end of which teachers will burn their mobilization orders). The Dodecannese islands sector 1 ELME will also participate in a demonstration with primary school teachers on 16 May to protest cutbacks to teaching posts. 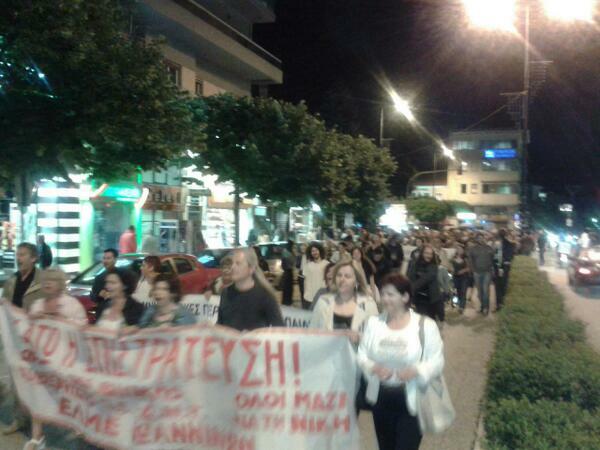 The Kavala ELME proposed organizing a panhellenic rally for education in Syntagma square on Friday 17 May and to demand the resignation of the Minister of Education, while establishing a struggle committee at the local level and holding a rally in Kavala on 16 May. The Karditsa ELME issued a strongly-worded statement asking teachers to take necessary measures for the strike to actually happen. The Larissa ELME voted a decision to stop paying member contributions to ADEDY. The Lesvos ELME is planning an open assembly and a demonstration on 16 May, as are the various ELME of Thessaloniki tonight. In Thessaloniki least two ELME (Thessaloniki sector 2, Thessaloniki sector 5) voted in favour of the strike. Paiania Municipality Workers' Union Οι καθηγητές και καθηγήτριες απεργούν για όλους μας και γι αυτό όλες και όλοι είμαστε στο πλευρό τους. The document with solidarity statements compiled by OLME also lists the Association of Private Sector and Local Government Archaeologists, the Association of Evening Class Tutors, the Association of parents and guardians of the 3rd secondary school of Peristeri, the Union of Parents' Associations of Agh. Paraskevi, the Association of Primary School and Kindergarten Teachers of the Argosaronikos Islands, the Greek Confederation of Parents and Guardians in Germany, the Pan-Hellenic Association of Retired Teachers, the Pan-Hellenic Union of Parents of Pupils in Musical and Arts Schools, the Movement of Citizens for Justice in Politics, the Pan-Hellenic Federation of Performing Arts, the Federation of Dock Workers, the Engineers' Union, the Federation of Hospital Doctors of Greece, the Greek Federation of Bank Employee unions, the UK National Union of Teachers, Intersyndical Valenciana, the Association of Parents and Guardians of the Tympaki High School, CGSP Enseignement (Belgium) and GEW-Bezirksvorstand Frankfurt.